We slept late this morning, getting up at 10:30 a.m. Because we had something scheduled for noon, we didn’t really feel that we had time to go somewhere else. So we decided to just take it easy this morning. Actually, I’d suggest that you pick a day to NOT do much, just so you can catch your breath and recover. The time change and the non-stop activity can really wear you out. We didn’t eat breakfast, knowing we were going to have a big lunch today (plus the buffet was closed by the time we got up). 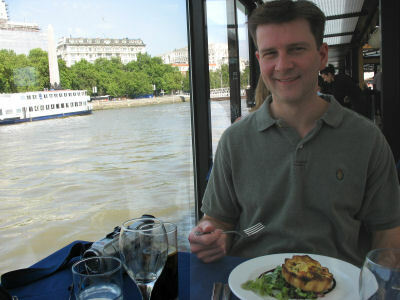 Before coming to London, we booked a lunchtime river cruise via the Internet. The cost was £22.50 per person, plus we unknowingly paid a £5 service charge. I think we booked the trip through a third party, rather than the actual cruise company (Bateaux), so they charged 5 extra pounds. Whenever possible, make sure you are booking through the actual company that provides the service. The website for the river cruise stated that jeans and shorts were not permitted on the cruise. So we made sure to bring some business-casual clothes with us on the trip. We ironed our clothes using the ironing board and iron in our hotel room, then got dressed. We left the hotel around 11:45 a.m.
Fortunately for us, the boat departed from Embankment Pier, which was only five minutes from our hotel. We made the short walk to the pier, but weren’t sure exactly where to get on board. In front of the entrance to the boat, there was a ticket office and I asked the person there where we needed to go or if we should to give him the tickets. He said to go down the walkway leading out to the boat, where they would take our tickets. 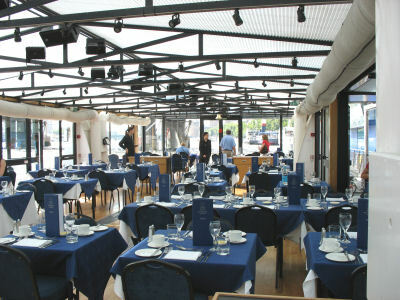 As we stepped onto the boat, the waitstaff was lined up, in anticipation of the guests’ arrival. We were immediately taken to our table and seated. The ship slowly filled up. Then, several very large tour groups came on board, and almost completely filled the ship. I did notice some people wearing jeans, so they obviously won’t turn people away if they aren’t wearing exactly the right clothes. At 12:30 p.m. the ship pulled away from the pier and headed just across the river to another pier directly in front of the London Eye. There we picked up a few extra passengers, then began the cruise. One complaint I had about the ship was that it was extremely hot. Our table was next to the windows, and we were sitting directly in the sun. Although there was air conditioning on board it was insufficient. Our waitress brought our first course, which was a quiche salad. I noticed a green sauce on the plate and immediately questioned whether or not it was a pesto sauce. A few years ago I discovered, by way of a trip to the emergency room, that I was allergic to pine nuts. Pine nut oil is used in many pesto sauces, and I have to be very careful when eating salads, breads and Italian foods. It seems that pine nuts have become more popular in recent years. The waitress came back to the table and I asked her if the salad had pine nuts in it. She didn’t think so, but I made it clear that I would DIE if I ate pine nuts. That’s no exaggeration. I almost did die the first time I ate them. So she went to check with the chef and found out that the salad did indeed have pine nuts in it. She took my plate, and returned with a salad which had no pesto sauce on. The quiche salad was delicious. Oh, and the rumor is not true. Real men DO eat quiche. While we were waiting for the main course to arrive, Susan insisted that we go outside on the deck and walkway, so we could get a better look and take some pictures. It’s a good thing she insisted we go then because there really was no time to go outside, as the meal took almost the entire cruise. 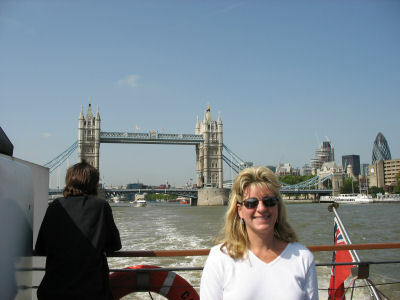 We got a couple of pictures of the Tower Bridge and London Bridge, then went back in to finish our meal. Very soon our main course was delivered to our table. We had pre-selected our dish when we booked the trip. I believe the choices were between chicken and salmon. We both chose the chicken. The chicken breast filets came with carrots, zucchini, green beans and baby potatoes, all in a delicious sauce. Next we received a tart lemon dessert, which was too tart for Susan, but not for me. I ate both. Next they brought coffee. Near the end of the cruise our waitress brought the bill. Bottled water was £3.50. Diet Coca-Dew was £1.80. Tips were not included in the original ticket price. We left a total of £12 to pay for the drinks and tip. When we booked the tickets we had the option to upgrade our meal to include drinks, and I believe there were other options as well. A full bar is on board, in case you want to get an adult beverage. The ship returned to the pier and we disembarked. Total time for the cruise was about 90 minutes. 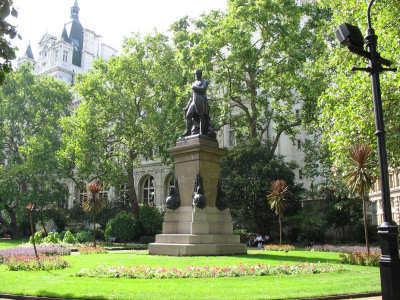 We walked back toward our hotel, detouring briefly through the Victoria Embankment Gardens, which is a park directly between the river and our hotel. It was a beautifully maintained park, and there were quite a few locals who were taking a break or eating lunch here.